carious lesions with pulpal involvement (these lesions are normally large and cause painful symptom). 1. Incipient caries lesion – The decay area is limited to the outermost layer of the tooth (enamel). The best treatment for the incipient caries consists of fissurotomy, preventive filling, and sealant. These procedures always can be performed without the use of local anesthetics (numbing shots). 2. Moderate carious lesion – The decay area completely penetrates through the enamel layer of the tooth and reaches the dentin layer. Most dentists recommend amalgam and composite fillings for these lesions. These procedures may require the use of local anesthetics. About 95% of the operations can be done without the numb shot, when an air abrasion or a hard tissue laser is used to remove the decay. 3. 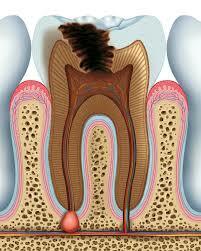 Advanced carious lesion – The decay area is within the dentin layer but not reaches the pulp yet. The treatment commonly recommended for these advanced lesions includes indirect (laboratory) porcelain or gold inlays, onlays, and partial crowns. The procedure is done by taking the impression of the defect, making a porcelain or gold restoration in the dental laboratory, and cementing the restoration to the defected tooth. Normally it would take two dental visits to finish the operation; however, the dentist can complete the whole operation in one seating, if the CEREC (CAD/CAM) technology is available. 1. Severe carious lesion with reversible pulpitis – The decay area is approaching the pulp and causing pulpal inflammatory hyperemia. Cold and hot application to the normally increases the pain; however, the pain disappears quickly after the stimulus is removed. The electrical pulp testing for the tooth in question shows normal vitality reading. The common treatment recommendation for these lesions consists of a direct or indirect pulp capping with a calcium hydroxyl appetite medication (dycal), placing a temporary sedative filling (IRM) on the defect for 4-6 weeks, and restoring it with the final restoration once the pain symptom completely disappears. Because the insurance companies typically do not pay for the sedative fillings, some patients elect to place the permanent restoration immediately. These patients take the risk of paying in full for the re-treatment, when the inflamed pulp fails to reverse to its healthy state. 2. Severe carious lesion with irreversible pulpitis – The decay area reaches the pulp and causes constant toothache. Cold and hot application increases pain and the pain lingers for more than 30 seconds after the stimulus is removed. 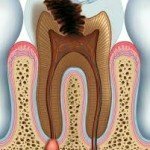 The tooth is sensitive to slight tapping and touching. The electrical pulp test shows abnormal vitality reading. The recommended treatment for these lesions is either a root canal therapy with a final crown or a tooth extraction with a final bridge or implant restoration.